Our recent chat with Ladytron touched on their friendly working relationship with Trent Reznor of Nine Inch Nails, who has been in the headlines lately for giving away his new album The Slip and an instrumentals collection called Ghosts I-IV for free online. It got us thinking about his last record with a fair number of instrumentals, 1999’s The Fragile. About a third of its 23 tracks have no vocals, and they’re some of Reznor’s most enduring work. They’re constantly being licensed for movies: “Just Like You Imagined” is now famous as the song from the 300 trailer, M. Night Shyamalan’s Unbreakable used the industrial blues stomp “The Mark Has Been Made” to great effect, and Tony Scott has worked multiple tracks from it into every movie he’s made for a decade. It’s rare that the world of film—which is unnaturally preoccupied with whatever’s new and hot at any given second—would continually revisit a record that’s nine years old, so it goes without saying that The Fragile has aged well. There’s only one problem: Trent Reznor hates it. But tragedy often inspires great art, and that’s certainly the case with The Fragile, which is unquestionably the most adventurous record he’s ever made and likely ever will make. It’s the sound of a guy who just had a huge hit record, wants to do something different, and is literally willing to try anything. There are lots of instruments here you’d never imagine hearing on an album by the writer of “Closer”: toy pianos, upright basses, ukeleles. And while it has the big radio singles to keep fans happy—the romantic epic “We’re In This Together Now” is probably the best straight-up rock song in the band’s discography and “Into The Void” is Reznor at his funkiest and most accessible—it’s the left field oddness that makes The Fragile so memorable. “Where Is Everybody,” for example, is essentially a rap song that uses an acoustic slap bass for its hook, and then closes with a majestic glam rock guitar solo straight out of Diamond Dogs-era Bowie. “I’m Looking Forward to Joining You, Finally” can only be described as a NIN attempt at Japanese Noh. And “La Mer,” the record’s best moment, is a rolling symphony that climaxes in a French Creole poetry reading. It’s easy to imagine Reznor as Howard Hughes here, a reclusive genius recording the same songs over and over again for five years, hiring string sections and Buddhist boys choirs, seeking the counsel of Dr. Dre and Adrian Belew of King Crimson, screaming “Bring me the guy who produced The Wall!” and having somebody actually do it. 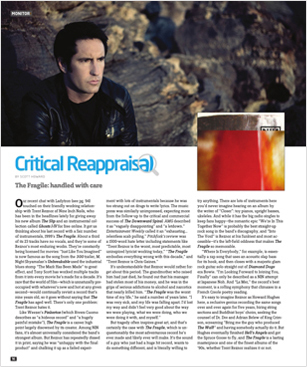 But Hughes eventually finished Hell’s Angels and got the Spruce Goose to fly, and The Fragile is a lasting masterpiece and one of the finest albums of the ‘90s, whether Trent Reznor realizes it or not.